Transparency: The assurance you need to invest | Franchising You. When you think of transparency, what comes to mind? In business, transparency refers to freedom from pretense or deceit, or a lack of hidden agendas. Transparency is a vital factor in business more so now, than ever before. You might be wondering why transparency is so important. Consumers and business owners are less trusting of companies and corporations than ever before. It is important that a potential franchisee is assured the brand he or she is considering investing in is honest, trustworthy, and transparent. As an individual looking to franchise, consider the following information. Look for a franchise company which allows easy access to financial and other vital information. As a prospective franchisee, you should be able to discern data and financial information quickly and easily. Stats you’ll want to research in your pre- investment planning are average location initial investment costs, average annual revenue per location, average profit per location, average length of time for a new location to become profitable, percentage of royalties paid to home office, franchise renewal fees, timing, and parameters. You should also research the variety and quality of corporate office services available, such as human resources, training, marketing, accounting, information systems, and other functions. Also, make sure the franchise fee and royalties paid per location are appropriate for the level of corporate support offered. What characteristics define the company’s culture? This can be just as important as the financial health of the company. Are current franchisees pleased with the company’s business model, executive management style, and the general direction in which the company is heading? Do the current franchisees feel valued, listened to, and supported by the franchisor? Are franchisees engaged with the system; do they meet regularly, communicate with each other, and attend annual or semi-annual meetings to stay in touch and engaged? These are all important gauges of a company’s overall values, culture, and management philosophy. It’s critically important to evaluate these attributes when deciding whether a franchise system will be a good fit for you. 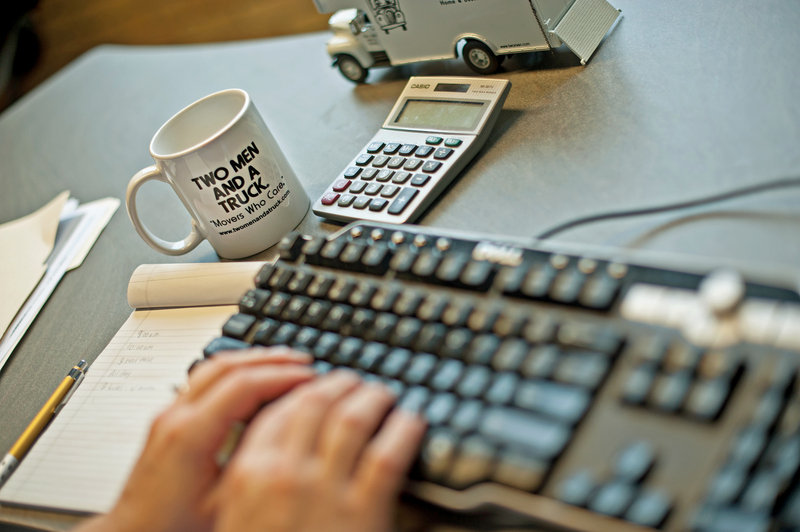 TWO MEN AND A TRUCK® prides itself on honesty, integrity, and transparency. Our core values are based on the Grandma Rule®, the founding family’s belief that all customers should be treated the way you would treat your grandmother – with kindness, integrity, and honesty. Our business practices exemplify our core values, and these values are purposefully considered with each company policy decision. Prospective franchisees are encouraged to contact current franchisees for open, honest feedback about TWO MEN AND A TRUCK®. All current franchisees can access real-time online reports showcasing each location’s financ ial performance, customer service, community service, and key metrics. An overview of these metrics is available to prospective franchisees as well. The popular and well-attended Annual Meeting is held every spring which is attended by approximately 90 percent of franchisee, along with their key team members; this indicates a robust employee interest in company events and culture. At the Annual Meeting, franchisees are encouraged to network, share best practices, collaborate to identify solutions to their challenges, learn more about the evolving industry and specific business practices, and interact with the corporate office staff – all activities which characterize a true “system of one.” TWO MEN AND A TRUCK® has more than a handful of franchise owners who have “grown up” in the system, starting as franchise location movers, drivers, or CSRs and eventually becoming franchisees of their very own franchise. Transparency, simply stated, means a company has nothing to hide. They’re not afraid to share financial, cultural, or business policy information because they’re confident in its accuracy and how it fosters a culture built on trust. TWO MEN AND A TRUCK® is defined by a strong vision which is executed by honest, caring people who treat others as we’d want our grandmother to be treated. Grandma would be so proud! For more information on starting your own TWO MEN AND A TRUCK® franchise location and the performance information available to prospective owners, visit our franchise development site.